The picture says it all. They are venerable villains brazenly repudiating the rule of law and demanding that we submit to a rule by the robed whose allegiance is to the Rjapaksa clan. The smug satisfaction of the receiver holding the bowl, the mock display of a cheque for Rupees Fifty Thousand by the giver and the approving glance of the rotund onlooker demonstrate the abysmal depth these spiritual stooges are ready to stoop to in their determination to restore the Rajapaksa kleptocracy. A few Buddhist monks paraded the streets of Colombo in a vain attempt to exploit people’s faith to persuade ordinary people in to believing that the recent high court judgement that convicted former Presidential Secretary Lalith Weeratunga and ex-DG, Telecommunication Regulatory Commission (TRC) Anusha Palpita was wrong and or was an erosion of Buddhist values and practices. What was more nauseating being their use of adolescent monks (Samaneras) to enhance their numbers. It is time the state brings these young ordained monks under the national child protection authority. As it turned out the people were not impressed. It was not the traditional ‘pindapatha’ footslog. Instead, it was a loud affair with party apparatchiks preceding them, screaming hoarse ‘Aney, Me Hamuduru warunta keeyak hari denta.’ In this age of image engineering one particular electronic media outlet did manage to show a clip of an irate Upasaka condemning Ranjan Ramanayake for his anti-clerical remarks. Yet, the exercise failed to arouse any Buddhist indignation that the organizers were desperately hoping to create. It is time we take note of this menace. It has two fronts. One is the authoritative voice that claims tradition and historical prerogatives. The other is the polemical protests of a maverick few. What we witnessed last Friday was the maverick few. We do not have a vibrant democracy. What we have today is what we got on 8th January 2015. It is only a procedural democracy. Our institutions are yet in the making. The Prime Minister is in no hurry to enact the legislation relating to the auditor general’s powers. That needs coaxing. The greater threat to our present procedural democracy slowly taking root after the ouster of the Mahinda monolith is from the dogmatic Buddhist monks who prefer the status quo of chaos and uncertainty. The pronouncements of the Asgiriya chapter seems to claim that they alone are the repositories of all wisdom on constitutional reforms. Let us be pragmatic. Mahinda Rajapaksa knew how to pander to the priestly class in the Sinhala Buddhist Gemeinschaft. He understood the importance of fostering an organic relationship between a Buddhist priestly class committed to his agenda and a devoted following among the Sinhala Buddhist majority. The Sinhala Sangha order that has emerged in the post-independence era has two potent weapons- faith of their following and the grace attached to the saffron robe. The Field Marshall Sarath Fonseka recently described the Buddhist monk Ven. Elle Gunawanse as a ‘cheevara dhariya’ which means a ‘a wearer of a robe’. The remark provoked a huge protest from the Sangha community. The perceived grace and sanctity attached to the saffron robe today made it a derisive substitute. In post war Sri Lanka, the Rajapaksa regime embarked on a myth building exercise that created a new institutional structure with a servile Sangha forming a privileged rent seeking class that served as intermediaries bridging piety, privilege and patrimony. In the eighties Bhikku Elle Gunwansa was embroiled in a controversy over a visit to Maldives in the company of a dainty trend setter of those times. 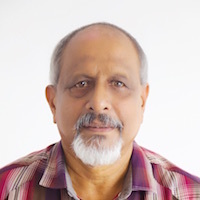 The brilliant Sinhala satirist Chinthana Jayasena published a column under the catchy title “Elle Pota Dekama Giyath, Himiyani Apa Oba Samagai.” They were times when Sinhala journalism was far less orthodox and irreverent wit commanded a discerning readership. Today he would be pilloried. The digression aside, contrary to the dictates of the Buddha, our contemporary sangha relies on blind belief, perceived ignorance of what the Buddha taught and rigidity of established tradition. Prime Minister Mrs. Bandaranaike and President Jayewardene studiedly avoided the gimmickry of ‘Apey Hamuduruwaney in their encounters with the Sinhala Sangha community. The Sinhala Sangha order has its own world view on their institutional survival. To them, truth and tradition are interchangeable. Ultimate reality is not nirvana but their hold on customs, habits and their own self-serving systems. The Judgement of the High court is in Sinhala. There is no doubt that both Bhikku Medagoda Abhayatissa and Bhikku Muruththettuwe Ananda are adequately equipped to comprehend the verdict. Then, why have they taken out their begging bowls in defense of the ousted tyrant? Because they reject reason. They want their lost world back. Its conveniences, its gratifications and pleasures. Mahinda Rajapaksa knew how to access the dark corrupt chambers in the hearts of the Sinhala Sangha. Lalith Weeratunga knew what he was doing. He did not expect Mahinda to lose the election. The Present dispensation cannot match the ingenuity of Mahinda. Mahinda presided over a patrimonial state apparatus which had defined compartments for an oligarchy, a coercive military and a parasitic priestly class largely composite of Sinhala Buddhist Sangha. The present dispensation attempts to follow him with little success. Instead of reforming the clerical order they have opted to offer incentives for cooperation. 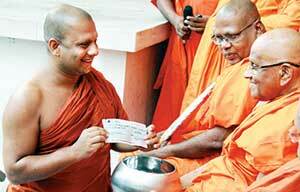 They have offered Diplomatic passports to Maha Nayake theros. They have set up a think tank consisting of Buddhist monks. One Mahanayake of a subsidiary chapter has been gifted with a Mercedes Benz limousine. Minister Kiriella deflects public criticisms of his handling of the central expressway by accusing critics of disrespect to the Dalada Maligawa! Yet Mahinda’s stranglehold remains largely intact. There is no shortage of the Sangha ready, willing and able to hold ‘Pandam’ for Gota’s Eliya. In the case of Mahinda, he was the hound and the sangha made up the hare. With the present dual centers of power, neither knows who runs and who hounds. The bond business has given the pseudo Lichchevi rule, the licking it deserves. Rohingya Crisis: Don’t Look Through Coloured Glasses! With Sangha like this, Buddhism needs no enemies. Written clearly exposing the peril of unsuitable guys wearing the yellow robe.During Lord Buddha’s time there were many who wore Yellow robe but were not buddhists. under the tree. Dogs having thought the man had fallen from the tree and pounced on their master and killed him . This is a lesson for guys wearing or covering their bodies with the yellow robe and parade as Buddhist Mon ks. Sarath you need to get this translated in to Sinhala so that majority will understand what you said.If there is a cost involved I will pay for it.